I woke up bright and early to go to the Rose Bowl flea market with three fun friends. It is so big, varied and overwhelming. I could spend 12 hours peeking around and thousands and thousands of dollars on unique and funky finds. I found some great treasures, most of which are either secret Christmas presents, need a little (a ton) of refurbishing, or are going to be boutique displays. Keep a look out for them in the future. What is it about buttons that makes me so happy? This yo-yo quilt was HUGE!!! As I am making a few dozen of them for hair clips (with a super easy yo-yo maker, mind you) it freaks me out that somebody made this by hand! I hope it finds a really good home. I loved this little booth. I even splurged on a treat for my girls here. When I excitedly showed Jason he said "you could make that...". Maybe, but sometimes it is just fun for the maker to buy something already made. 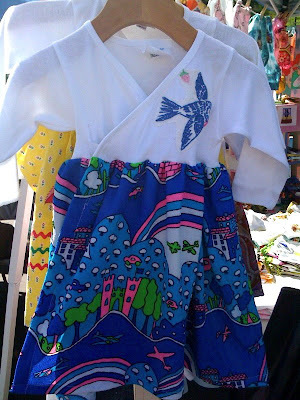 What I do plan on making is wrap dresses like this one. I have a huge stack of these convenient, yet boring snap shirts that need a little cute-ing up. 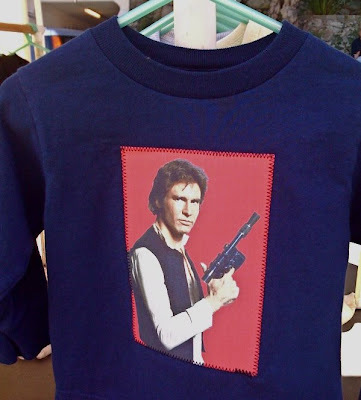 If I ever have a boy, you better bet he would be rocking one (or a dozen) of these Star Wars shirts. I am really regretting not splurging on this set. Milk glass and egg nog? Is there a better combo? I am in the I heart egg nog minority and am impatiently counting down the days until Starbucks brings back the Egg Nog Latte. It is my favorite holiday indulgence. As if the flea market itself wasn't enough to make yesterday the best day ever, Jason took me on a date to yummy Italian food and the movies. We saw Fireproof. We are admitted movie brats and went into it with rather low expectations. It might not have the best writing or acting, but it's message is very powerful and amazing. I would truly recommend it, even to the most jaded movie critic. It is an evening's investment worth making. I have been following your posts, honestly I always thought your name was Joy! It is a lovely name and the posts you have made about your daughter made me cry for you, for her, for your husband. You are STRONG, for I have no idea how I could have kept trying. Thanks for the "whats in a name series" I needed (for some reason) to read all that you went through. 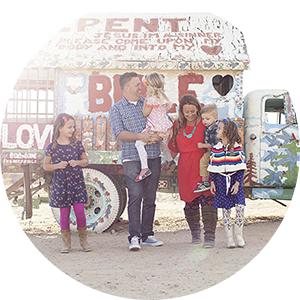 Ps- I love your crafts, my favorite that I have done over and over for gifts is the metal bucket with scrap paper and spray paint! thanks for the inspiration! I've been wanting to check out the Rose Bowl market. One day. Glad you let us know about the movie, have been waiting for a "review"! So I am pretty darn sure that my grandma has that set of egg nog dishes!! They look SO familiar to me! 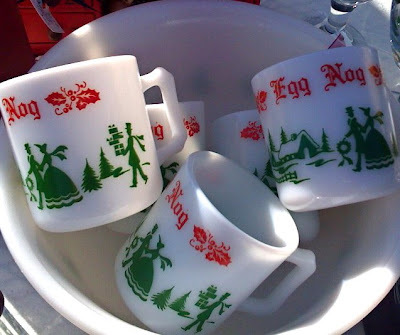 I am in the group that doesn't like egg nog (I don't like milk either), but the dishes are really neat!! There was a time I would not have been seen at a flea market or a garage sale, but I have come a LONG way and changed so much over the last few years! 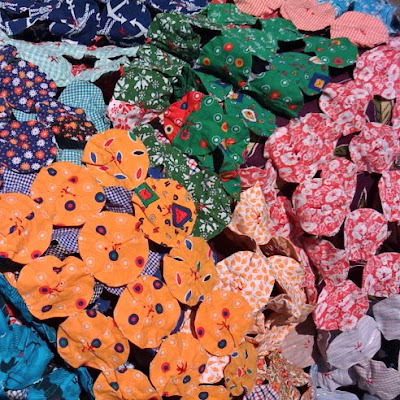 I am now a lover of all the vintage goodness and wish I had more!! Glad you had a fun day today!! Hope you have a fabulous week to follow it up!! 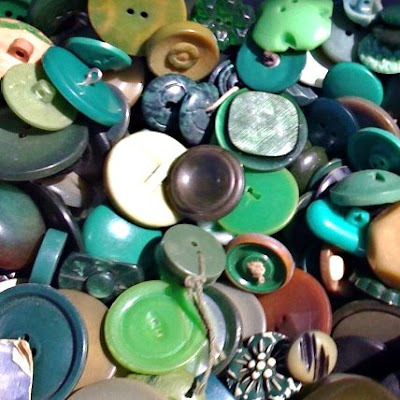 I looooove buttons, especially vintage ones and the milk glass will probably always catch my eye! I’m actually in the process of trying to join the Button Floozies blog (http://buttonfloozies.blogspot.com/), but am getting an error message, so it looks like I’ll have to wait a bit longer to share. I’ve never seen those mugs before. They are so cute and perfect for yummy eggnog. Have a great day!